Batch example An example outlining how a module can define batch operations. Block example An example outlining how a module can define blocks. E-mail example Demonstrate Drupal's e-mail APIs. Element example An example demonstrating how a module can define custom form elements. 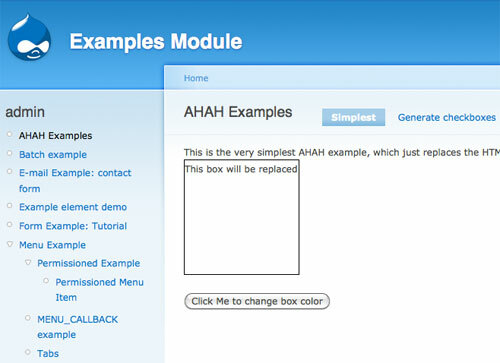 Filter example An example module showing how to define a custom filter. Form example Examples of using the Drupal Form API. Menu example An example of advanced uses of the menu APIs. Node access example An example illustrating how to restrict access to nodes based on some criterion associated with the user. Node example An example module showing how define a custom content type. NodeAPI example An example module showing how to extend existing content types. Page example An example module showing how to define a page to be displayed to the user at a given URL. Scaffolding example Provides example scaffolding for a module that maintains its own database table, and exposes an editing interface for the module's data. SimpleTest example Used to demonstrate the SimpleTest test suite. Trigger example An example showing how a module can provide triggers that can have actions associated with them. Vertical tabs example Show how to use vertical tabs for enhancing user experience. XMLRPC example This is an example of how to implement XML-RPC callbacks by implementing a validation suite. These modules are not just code fragments, they're working examples. Once a specific example module is enabled on the modules admin page (/admin/build/modules) it appears as a menu item in the Admin Menu and can be viewed as a working Drupal web page. 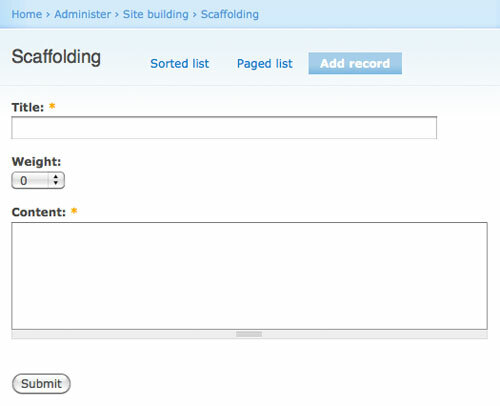 Some examples, such as the scaffolding example, also create other administration pages. The Examples module may not answer all of your coding questions but it does provide a high-quality starting point. Many thanks to Randy Fay for initiating this project and to the many people who have added and improved the examples.